At the heart of all modern control systems lies software. Each equipment manufacturer supplies software solutions that range from comprehensive integrated product suites to specialized task-specific programs that maximize the capabilities of the hardware selected. Mitsubishi Electric Automation knows that total cost of ownership for any system is significantly impacted by the software driving the system. That’s why their Melsoft product makes use of powerful simulation tools to help reduce programming and debug time. Also, visualization products help machine operators improve operational efficiencies, and maintenance tools help owners to significantly decrease repair times. All along, empowering people as they perform their jobs as fast as possible, with the least effort. iQ Works, also from MEAU is a comprehensive highly graphical software suite with a focus on intuitive programming, and a fully customizable workspace setup of Mitsubishi Electric systems. This includes network configuration, PLC programming, motion controller and servo setup, and HMI (GOT) screen design. At the control element level, GX Works3 programs and configures the iQ-F and iQ-R controllers. 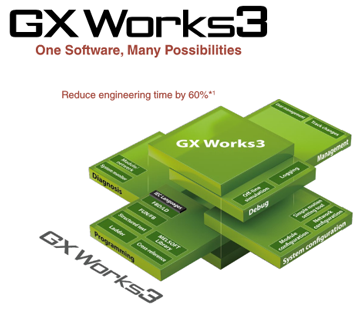 The prior generation of controllers, FX, L, and Q use GX Works2 for programming and configuring. Because GX3 and GX2 conform to IEC61131-3 standards, developers can mix and match five languages, while they save elements of different projects in common libraries which can then be used on future applications. Other control equipment suppliers like Advantech supply browser-based packages for HMI/SCADA software, including SCADA Server, Excel Reporting, Widget Library, and Remote Device. For system-wide control software, or application specific solutions, HTE Automation supplies and supports manufacturing software in Kansas, Missouri, and Illinois.